Ahead of the thick of the winter spell, take your car in for a full servicing to check everything is in good working order. The average car battery has a lifetime of around 5 years, but sometimes they can begin to burn out at the 3 year mark. If your battery is at least 3 years old, you should prioritise a pre-winter check-up. At this point, the mechanic might tell you that your battery is about to bite the dust. Replace it and you’ll save yourself a lot of time and frustration in the winter months! Alternatively, your battery might still have some life in it for the foreseeable future as long as you maintain it properly. County Battery offer free battery testing, so there’s no excuses to put it off! When your battery is trapped under layer of dirt and grime or coated in a white powder that shows it’s corroded, it will restrict the flow of electricity through it. Inspect your battery regularly for signs of corrosion. If your battery becomes a victim, it’s easy to rejuvenate as long as you catch it early on. After safely disconnecting the battery, scrubbing with a wire brush can help remove the white coating. Alternatively, mix baking soda and hot water and scrub the affected areas with a toothbrush dipped in the solution. If you’re not comfortable doing it yourself, get a professional mechanic to spruce it up for you. Car batteries, like people, hate feeling too chilly. 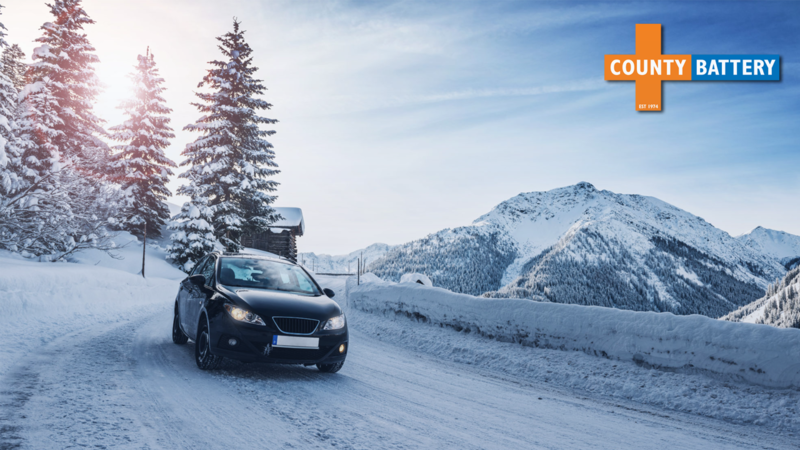 The extreme cold temperatures we experience in the winter months affect the chemical processes in a battery. It has to work extra hard to produce and store electricity. Placing your battery under this strain is a surefire way to reduce its lifespan, so it’s important to protect it from the elements. If you have a garage, park your car inside it where possible. If you don’t have access to a garage, make sure it’s parked facing away from the wind. You can invest in a car cover fairly cheaply too for extra protection. Recharging your car battery frequently over the winter period is advised to keep it in tip-top condition. Your car battery is not a fan of regular, short trips. These trips don’t allow it to recharge properly, causing its power to fizzle out more easily. Source a good quality car battery charger designed for your battery type and get into the habit of charging it up regularly. Tasking your battery with too many jobs at once will drain it quickly. As painful as it may sound, when you slide into the driver's’ seat on a frosty winter morning, turn on the engine but nothing else for a while. Allow the alternator to charge up the battery before slamming on the heating, headlights, and radio. Immediately turning all of these can cause your battery to lose the little power it has generated after turning on. Similarly, so your battery doesn’t have to use power to turn on in-car accessories and features when it turns on for your next journey, turn everything off before you turn your engine off. Don’t leave things like inbuilt SatNav, radio, and your heating on for longer than you need them to save precious battery energy. Whilst you can, in theory, jump start your battery in an emergency, it’s best not to wait until it gets to this stage. Follow our advice and your battery will be in optimum condition to battle against bad weather! Tom Butcher is a freelance writer who recently escaped the world of print journalism. He covers a wide range of topics, including business, motoring and digital.